Membership in First Unitarian Church is conferred when the individual feels ready to commit to participation in the life of the church. This usually means that the person has attended services and forums, has attended at least one of the monthly Welcome Suppers, has participated in several (or all) of the Information sessions organized by the Belonging Task Force, and feels comfortable with our congregation and our Unitarian beliefs. Candidates for membership are reviewed by the Belonging Task Force and recommended to the Board of Trustees for approval. Members may sign the book at any time when all agree that this is appropriate; members are eligible to vote in congregational meetings 90 days after signing as members. Formal Ingathering services are held within the Sunday service two-three times per year. 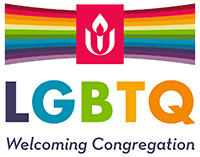 First Unitarian follows the UU denomination position as a non-creedal religion. This does not mean that members are without religious belief, but that each person ultimately must define their own belief. We currently have small groups organized around UU humanism and Christianity faiths. Our view of religious creed is founded in our Unitarian principles which emphasize free inquiry and respect for the beliefs of others. We expect active members to participate in church activities and to contribute time, talents, and money to the church’s well being. Most new members want to be involved beyond attendance at Sunday services, though this is a very important time for us to gather together in celebration and contemplation. However, we respect the schedule demands and priorities of members, and we strive to protect members from over-commitment.